Let’s walk through the process of mapping Wi-Fi network coverage in retail or office locations. 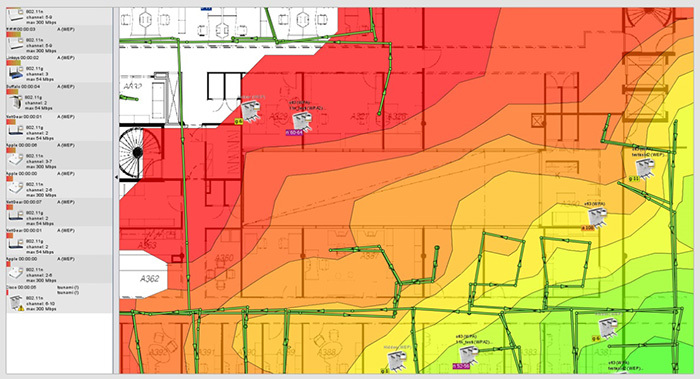 What you will be creating is called a Wi-Fi heat map and it is an essential tool for you to optimize your wireless network coverage. Instead of guesstimating where your Wi-Fi coverage is weak, a Wi-Fi heat map will tell you exactly where your network has strong coverage and where it has weak coverage. In addition, you can also use it to see what other wireless networks are nearby and could potentially interfere with your business’ network. To get started on creating a Wi-Fi heat map, you will need the following. Ekahau’s free HeatMapper™ – It is compatible with Windows 8, 7, Vista, and XP operating systems (64 and 32 bit versions). You will be asked to provide an e-mail address, name, company name, country, and the number of Wi-Fi routers and access points in your network. Once you have provided in the requested information, you will be e-mailed a download link for the tool. (Optional) A floor plan of your office saved in an image format. Though we use Ekahau HeatMapper for this article, there are other alternatives for Windows, Mac, iOS, and Android operating systems. The reason we selected HeatMapper is because it is easy to use and free. For the floor plan, you do not need a detailed building blueprint. A simple hand drawn sketch should be sufficient – as long as it has an outline of the walls. For our example, we had a cubicle map in .jpg that showed the rooms and walls. After removing the cubicles and other extraneous elements, we had a workable map. Once you have everything required, you are ready to start! 1) Install HeatMapper on the laptop that you will be using to test coverage. 2) Launch the program. It will ask if you have a map of the area that you will be mapping. Please note that you will need Administrator access in order for the program to work. 3) Choose “I have a map image”. A new screen with your map and a list of all the detected access points will appear, with directions on how to use HeatMapper on the right side of the screen. 4) On the map, click on your current location in the office. This will be your starting point. 5) Walk a short distance in a straight line and when you stop, left click on where you are on the map. Be sure to be as accurate as possible when recording your position on the map. 6) Turn and walk in another direction. Each time you stop, you should update your location on the heat map before continuing. You will notice a green trail on the map that will highlight where you have been. Try to fill up the space as much as possible, as this will improve the accuracy of your Wi-Fi heat map. 7) When you are done, right click to stop mapping. At this point, HeatMapper will display a heat map of all the Wi-Fi network coverage and overlay the approximate locations of all detected access points. Hovering over each access point will display its distinct heat map. 8) You have now made a Wi-Fi heat map of your office. Though we used HeatMapper for this article, there may be other solutions available depending on your device and operating system. The list on the left side of your screen will show every access point that the HeatMapper can detect and the main screen is your actual heat map. By default you will need a heat map of Wi-Fi coverage for all detected access points. To see the heat map specifically for one access point, left click on it. To save your heat map, click the Take Screenshot button in the top left of the screen. So now that you know where your network’s coverage is weak and where it is strong, you can formulate a strategy on how to improve it. Interfering Wi-Fi networks – In our case, you can see that our office is surrounded by other wireless networks. In a situation like this, it is best to switch to a different, less crowded channel. While this will not improve coverage, it may lead to increased transmission speeds and fewer signal drops. Insufficient coverage – If your issue is insufficient network coverage, there several different solutions that you can try. Move the Access Point – The first and simplest is to move your access point so that it is in a central area of the office. Try to mount it to the ceiling or somewhere high on the wall to reduce interference. Add Access Points – If your office is wired for Ethernet, you can connect another access point and have it transmit the network where coverage is weak. Add Repeaters – If you cannot connect another access point via Ethernet, you can use Wi-Fi repeaters to boost the effective range of your existing network. It is also possible to use routers and access points, as long as they can be configured to function as repeaters. How do you factor in WAP’s on the floor above/below? With the free HeatMapper tool used in the article, multi-floor surveying is not supported unfortunately. For that, I am not aware of any freeware heat mapping tool. If you happen to come across one, please let me know! Thank you for article. I found similar to Heatmapper Wi-Fi survey but for Mac and it’s free, check this out: http://www.netspotapp.com . I hope this information will be useful to you.